Is the Kokoro (Spirit) of the candidate as strong as the one of the shinsain (Judge) ? Try to not mix up your reasons/goal (Mokuteki) with objectives (Mokuhyô) ? The reason/goal of your practice is “The evolution of your human behaviour through the practice (Shûren) and respect of the sword principles”. The final goal should not be replaced by objectives like passing an examination or winning a competition. All those objectives are only steps you have to go through (milestones) to reach the bigger goal/reason. If you establish objectives as goal then you miss the point. Within the same idea, for an examination, It is the way one will broach the hansei that is important and not the final result. Change your keiko’s spirit, your kokorogamae. It is by understanding this that one can express the kokorogamae in Iaido. The kokorogamae will be different for each of us. In fact it depends on what has brought you to Iaido, what gave you the urge to master Iaido. It is good to go back to the origins and remind yourself why and with what goal you started Iaido. For example for me I started Iaido to improve my kendo and I always try to keep kendo fighting situation in mind while practising. You should be ready and open for remarks and criticism. to be able to do that you have to become idiot and by idiot I mean that you have to sincerely dive into the received teachings. Sincerity will allow you to receive entirely and will motivate the sensei to teach you more points. This sincerity will also allow you to keep heijôshin, calm the spirit and facilitates the creation of the kasôteki. Even more important, humility linked to the desire to constantly learn is crucial. Learning from your shi (Shyushô/shishoo=Main teacher), learning from others, learning from yourself and the location. Those 4 sources of learning should stay clear in your head while training. For examinations, sahô (ceremonial) and clothing are crucial (Jûyô) points. It is necessary for them to be perfect and are inseparable from the Kokorogamae. If there is a correct kokorogamae there will be from the sahô to reihô a sense of self perfection. Sahô and reihô are not a succession of predefined movements, it will also show how much you involves your spirit/heart. The Torei totally changes if your heart/spirit says “onegaishimasu, arigatôgozaimashita” or not. Your depth of practice is also reflected by how you move in the dojo and is something essential for 8th dan candidates. Judges want to see attitude and movements that are crowned with hinkaku (dignity). Are your eyes watching the kasôteki ? It is obvious that technique should reflect the practitioner’s grade. It is out of question to think having reached a level once a dan has been awarded. If a 6th dan is not close to 7th dan, it would be impossible to consider the 7th dan examination as a crossing point. There should be a difference of execution in movements like nukitsuke, kiritsuke, chiburi, nôtô between a beginner, mid and higher grade. Basic movements, foundations should be acquired by 3rd dan. It is impossible to build something if the foundations are not solid/strong. From the nukitsuke to the nôtô everything start from the left. If we want to perform an “explosive” nukitsuke you need to perform a strong sayabiki. When the left hand grips the koiguchi, the little finger should push strongly following the Obi, pushing the koiguchi backward and not on the side. The kirioroshi should not scratch the ceiling but rather sweep it in order to use the monouchi correctly. The hasuji should be correct and the kirioroshi should be using the left hand tenouchi. The chiburi should of course have a correct angle but in addition it should be performed with the spirit “If you move I pierce you” towards your opponent, you have to move your ki and your kissaki together with this intention. The nôtô should be performed at tsubamoto displaying seme, protection and calmness. It is important to practice a keiko without suki/opening. For mid level 4th and 5th dan it is required to have placid spirit and improvements on metsuke, kihaki (energy/determination) and the kikentai no itchi. “The eye speak more than the mouth” this saying is so true. It is really a pity to see a wonderful technique wasted by a blink of an eye loosing contact with the opponent or a metsuke following the kissaki or worst looking where the enemy is not. You have to be able to create a real opponent and your eyes should be consistently following him. It is the only way to have a living iaido. The eyes are reflecting the kokoro (hearth/spirit) state. It is only when your eyes will follow the opponent that we will sense/understand the power of your waza. It you present yourself without self-assurance, nervous, anxious, we will see it in your eyes. Riai, Fuukaku, Hinkaku is what is asked to higher grade. The accumulation of experience and knowledge. That is what we as judges are looking for while assessing the depth and understanding of your practice. It is not only acquired through keiko but should also be filled with day to day life experiences. The wazamae should of course reflect enough riai understanding and one should be dedicated/devoted to the correct teaching and transmission of Iaido’s traditional culture. Based on my experience I deliver you my thoughts about kokorogamae and embu for examination candidates. 1. Is the state of mind mushin ? Mushin is very important for kokorogamae and something that should be present entering the examination hall. The spirit should be cleaned of any personal interests. It is most probably mushin that leads to a good enzan no metsuke. 2. Is the Wazamae embu(do) (martial technique performance) and not embu(yo) (dance) ? The waza should be a martial art demonstration and not dance. The ma, maai, kensabaki, taisabaki, ashisabaki, tenouchi, the sword becoming one with the body, all those elements should fit together. The kirioshi is not separated from the furikaburi, we do the furikaburi with the purpose of cutting, that’s why we should not stop (tome) after the furikaburi, but we do it with tame (accumulation). Tome and tame should not be confused. 3. Are Kankyûkyôjaku and johakyu visible ? In the waza there should be shikan(relaxation)/kinchô(tension)/stength(Kyô)/softeness(Jyaku) but also rhythm. In a waza there are peaks and valleys, peaks only exist because there are valleys. The beginning of kata should done with the saya no uchi no shôbu spirit, followed by violent moments such as nukitsuke and kirioroshi interspersed by seme, zanshin phases and calmness during chiburi and nôto. 4. Are the shoulder relaxed ? Stopping breath and tension in the shoulder should be avoided. I would like high grades to study/work on their breathing using the hara with abdominal muscles contractions. Breathing in to accumulate it in the hara and breathing out slowly will relieve tension in the shoulder. Of course performing a long kata only breathing out is difficult. It is through practice that you will be able to find your way to efficiently link breathing in and breathing out moments. 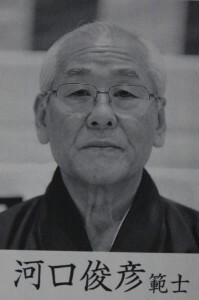 I remember watching my sensei during cold winter to see (steam coming out of his mouth) when and how he was breathing. Nothing can save you from a shiteiwaza or overtime. It is also very hard to be forgiven for a missed noto or inner kata mistake. Sometimes the problem is also the attitude following a mistake. A lenient thought such as “The err is human” is absolutely not acceptable. An error such as overtime can be avoided by training properly. Do not take too much time for hajime no tôrei and owari no tôrei, you have to start your waza after maximum 1 minute. I remember the time it was 5 kata in 5 minutes, this was not impossible. Prepare yourself for a clean and rapid reihô, adjust your keiko in order to have enough time for zanshin. The teachings I just mentioned come from my sempai and sensei’s whom I humbly ask forgiveness. I wish success to all senior grade candidates. I hope they will become good teachers and take care of the development of Iaido. There is no retirement for challenges. ** We are no professional translators and the above chapter excerpt may contain errors. These excerpts translation was very long and complex. It’s only purpose is to give you a general idea of the content and spread/share it with you. This article was originally published in a book called “Shinsa-In No Me” (The Eye of the Examiner) and it is with kind permission of the publisher Taiiku and Sports Co. http://www/taiiku-sports.co.jp that we are able to provide these to all for free circulation. 1. These essays are the property of Taiiku and Sports Publishing Co. who have kindly allowed them to be freely distributed. 2. They may be copied but must remain in the format shown. 3. The articles may be not be sold or used in any way for financial gain. 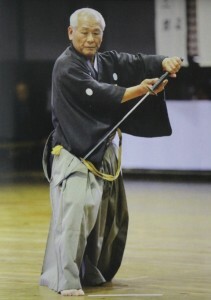 Posted: February 13th, 2012 under Article, Iaido.